Our villa consists of two lovely bedrooms which invites you to relax. It's so nice and quiet you may not heard any vehicles or other persons at all. Great for a honeymoon or relaxing visit. Luxuriant plants and manicured garden around the bedrooms will surely give you fresh atmosphere. Completed with a little kitchen to prepare drinks and simple meals, the master bedroom has a living area of its own. It has also beautiful marble floor, a high traditional ceiling and a classy mahogany wooden interior design along with light blue walls, and full length glass windows and doors to enjoy the valley view for a serene ambiance. The room embraces beautiful canopied double bed, a sofa-bed where you can lounge and watch TV, a seating area for intimate breakfasts and there are relax chairs for reading a book. Master bedroom has a lovely large outdoor toilet that looks on the jungle. The en-suite bathroom features a built-in bathtub where you can hear bathe with the sounds of the river, birds and wind in the background. The guest bedroom is located little higher up the cliff, in a private pavilion with direct access to the swimming pool. This room breathes serenity with light blue walls, lovely garden view and Mahogany wooden furniture. There is also a wardrobe closet with a safety deposit, mini bar, and canopied king size bed which can be converted into twins upon request. The en-suite bathroom boasts a tropical waterfall shower, pouring down from the Balinese stone-carved creature. Instead of living room we provide "Bale Bengong" as a place to relax and enjoy the serenity in the middle of green atmosphere and wide tropical valley view. Blended in with the extraordinary natural environment, the living area is found in a Balinese Balé Bengong (gazebo). It is a rectangular gazebo with an open air style, purple curtains, beautiful antique sofa's and a circular wooden table with chairs. The place to come if you want to meditate, yoga, writes or read a book, perfect for romantic alfresco dinning with candles burning and the right music playing. The atmosphere on this lovely designed living area and garden around it is truly unique to experience. We have two kitchen at The Mahogany Villa, one located beside the master room and it is use for private access of the guest staying at the entire room. The other kitchen is located near the entrance and it is use for the cooking of the guests meal such as breakfast, lunch, and diner. Other than that we also provide BBQ fasilities and it is place on Bale Bengong (gazebo) for guest special request. You will be warmly greeted by a Buddha sculpture upon entering through the Balinese gate at the villa. The stone steps with manicured garden around it will lead you down the beautiful valley to the villa's pavilions. On the edge of the cliff you will find a stunning infinity pool with size of 6 m x 2 m length and 1, 5 m depth. Rather small but nice with little Jacuzzi jets and good for cooling down on the hot days. Deck chairs are available for sunbathe on the loungers or read a book in the shade of the parasol. The Buddha terrace by the pool is also another great place to relax and have drinks at the antique table and chairs, surrounded by greenery, Buddha sculptures and the impressive jungle valley in front of you. While lodging at our wonderful villa, you can enjoy the warmth of a family through our personalized services and vast range facilities. We are committed to please, enhance your experience, and take care of everything so you can sit back, relax and have an unforgettable stay with us. The charming and friendly Balinese staff, with their bright smiles and professional attitude will look after around the clock to ensure that all your holiday wishes are met. "Bale Bengong" Living and Dining Bale - Dining for four, occasional chairs, BBQ table and facilities, and a lazy chair. There are 2 speakers connected from master room to play music. Private swimming pool - Four sun beds and pool towels. Tropical parkland gardens – 2700sqm of lush tropical gardens with unlimited valley view. Cable TV with international channels. All bed linen, towels, toilet paper, and drinking water are provided. Normal household supplies such as toilet paper, soap etc. are included in the rental price and will be replenished as needed. It's more than just a villa, it's villa place for joy. Green Atmosphere Surrounded by Natural Forest and Valley View. Good for Spiritual Retreat (Yoga, Meditation, Healing Therapy). 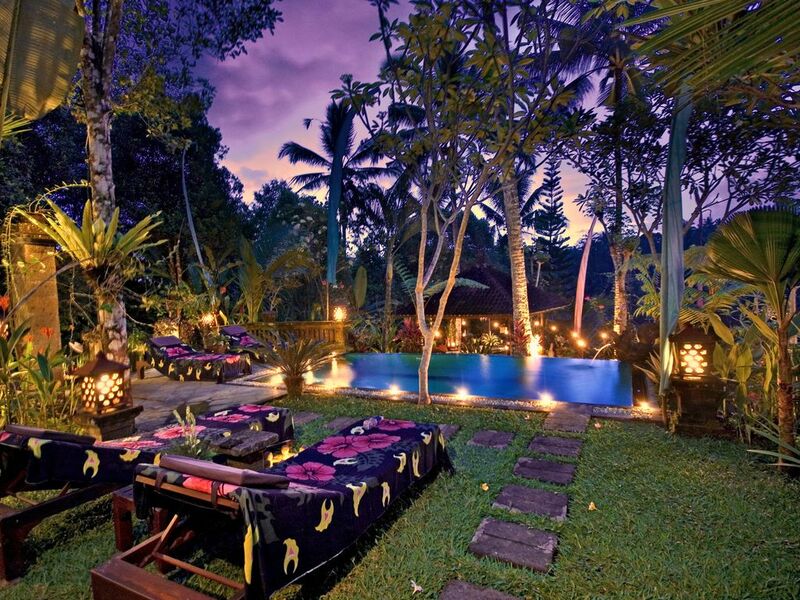 Located in Pakerisan River Bank and Close to Cultural Heritage (Gunung Kawi, Tirta Empul, Goa Gajah, etc.) Rice Paddy Terrace near by with Traditional Village Atmosphere (Wood Carving, Temple Ceremony, Traditional Market, etc) Beautiful Decoration and Lighting at Night, a Romantic Place for Honeymooner.